Please note that this form is not used to collect personal data. The information transmitted via this form is not protected in accordance with the requirements of the Russian legislation on personal data. Please check your e-mail inbox! 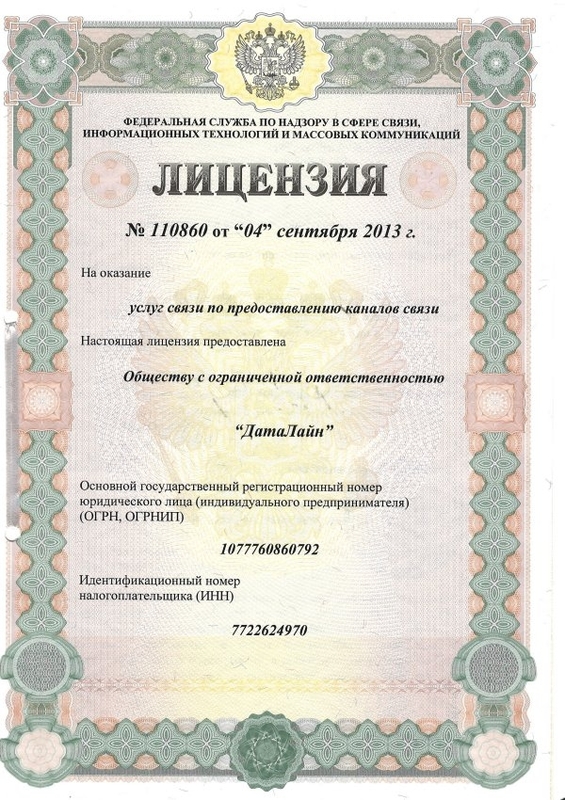 DFG152 is certified application, developed as required under the Federal Service for Technical and Export Control (FSTEC) of Russia that enables organizations to process personal data in full compliance with Federal Law dated 27.07.2006 No. 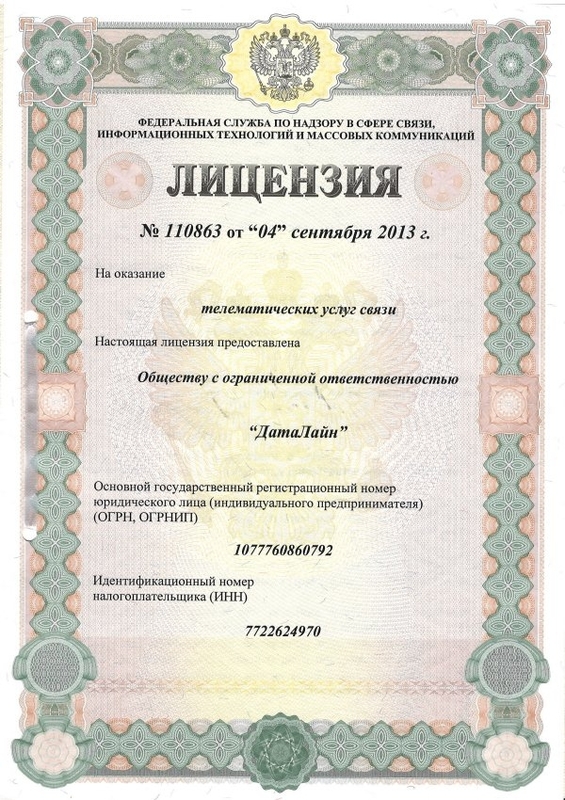 152-FZ (as amended on 21.07.2014) "On Personal Data"
MASTERDATA Company is proud to announce successful completion of the certification process for the DFG152 software and obtaining a FSTEC Certificate. 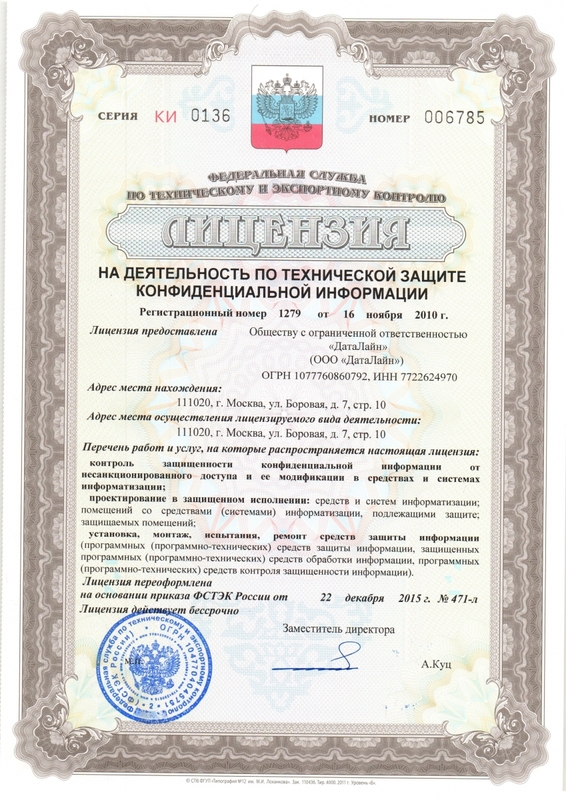 This certificate в„–3766 was issued June 30, 2017 on the results of successfully passed certification tests conducted by the testing laboratory Echelon NPO CJSC. 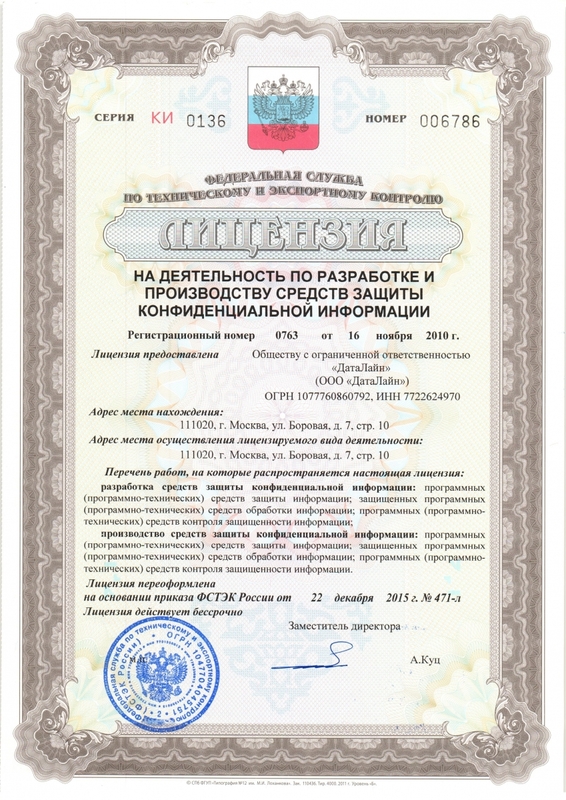 The certificate states that DFG152 solution developed by the MASTERDATA Company in accordance with the specifications RU.81363339.501410.001 TU meets the requirements of the document entitled В«Protection against unauthorized access to information Part 1. Software protection information. Classification by the level of control of absence undeclared -bath optionsВ» by the security level of 4 when implementing the operating instructions. Successful certification by FSTEC is an indicator of reliability of the DFG152 software and gives the opportunity to actively work with confidential information and personal data. Moscow’s Tagansky district court granted the petition to Roskomnadzor, but this decision has not yet entered into force. LinkedIn appeal to the Moscow City Court, which meeting will be held on 10 November. Roskomnadzor intends to limit access to the largest business social network LinkedIn as reported by “Kommersant”. Office believes that LinkedIn is breaking the law “On Personal Data” as it did not move their servers to Russia, and also collects and transmits information about citizens who are not users of the network, without their consent. It is reported that the law violations were identified during the inspection, which began due to the publications in the media about the repeated leaks of user information from this social network. According to Roskomnadzor, the agency has twice sent requests for information on the networkвЂ™s compliance with the personal data law to LinkedIn. Roskomnadzor has not received any essential answer. LinkedIn is the largest business networking and job search site. In 2015 the site exceeded 400 million registered users. Of those, 5 million were from Russia. On September 22, 2016 Mikhail Emelyannikov, an expert in the fields of Information Security, Personal Data Protection, Trade Secrets and State Control of Privacy, spoke at the American Chamber of Commerce in Russia (AmCham) conference. In his report, Mikhail spoke about the вЂњOn Personal DataвЂќ law, explaining the legal amendments introduced and dwelled on the difficulties that the trade secret owners and personal data operators might come across. Mr. Emelyannikov talked about the fact that many users of the Salesforce CRM system have found it very difficult to comply with the amendments to Federal Law No. 242. Luckily, the market now offers solutions developed specifically for that purpose. DFG152 is one of the solutions. It enables usage of foreign CRM systems (like Salesforce) in consideration of the new legal requirements. It was the 16th AmCham conference in an annual series which the chamber dedicated to the issues of business development and investment. The topic of this yearвЂ™s discussion was: вЂњRussia: Boosting Economic Growth and Expanding Opportunities for InvestmentвЂќ. The event hosted 200 business executives, representatives of the state authorities, an expert community, and mass media. The conference was hosted at Four Seasons Hotel in Moscow. The speakers included: Alexis Rodzianko (President and Chief Executive Officer, American Chamber of Commerce in Russia, Daniel Thorniley (President, DT-Global Business Consulting), Aleksandr Ivlev (Managing Partner, EY Russia), Andrey Shemetov (Vice-President, Head of the Global Markets Department, Sberbank CIB), Thomas Graham (Managing Director, Kissinger Associates, Inc.), Daniel Russell (President, General Director, US-Russia Business Council), Andrey Streltsov (Head of Department for Strategies, Business Development and Financial Markets, United Company RUSAL), Mikhail Emelyannikov (Managing Partner, Emelyannikov, Popova i Partnery), Vasiliy Osmakov (Deputy Minister of Industry and Trade of the Russian Federation), Maksim Smirnov (President, Arkonik Russia), and Maher Batruni (Chief Executive Officer, Wrigley Russia). The main program of the conference focused on the prospects of economic growth in Russia, a discussion of the investment climate in the country, as well as on the ways to manage the consequences of sanctions. The representatives of the national and foreign business community also tackled the issues of personal data processing and information security. The American Chamber of Commerce in Russia is a leading foreign association of the business community in the country. It represents the interests of about 500 companies involved in various economic fields in the USA, Russia, Europe, and Asia. The basis of the complex product DFG152 is anonymization of personal data, which enables linking stored and processed information to a specific individual - first name, last name - to a token, i.e. a group of identifiers. The data linking identity information to tokens does not leave the borders of the Russian Federation and must be stored at the customer's site or in the cloud of the Russian provider, all the technical means of which are on the territory of Russia. Thus, the use of this solution frees the operator from the need to perform costly, time-consuming and technically complex works to fully transfer the computing infrastructure and information system to the Russian Federation and allows the use of cloud services located outside of Russia. Starting September 2015, all companies operating in Russia are required to store store personal data of Russian citizens on servers physically located in Russia. (Article 2 of Federal Law dated July 21, 2014 No. 242-FZ "On Amendments to Certain Legislative Acts of the Russian Federation regarding the Procedure for Processing of Personal Data in Information and Telecommunications Networks", Federal Law dated December 31, 2014 No. 526-FZ "On Amendments to Article 4 of Federal Law "On Amendments to Certain Legislative Acts of the Russian Federation regarding the Procedure for Processing of Personal Data in Information and Telecommunications Networks"). 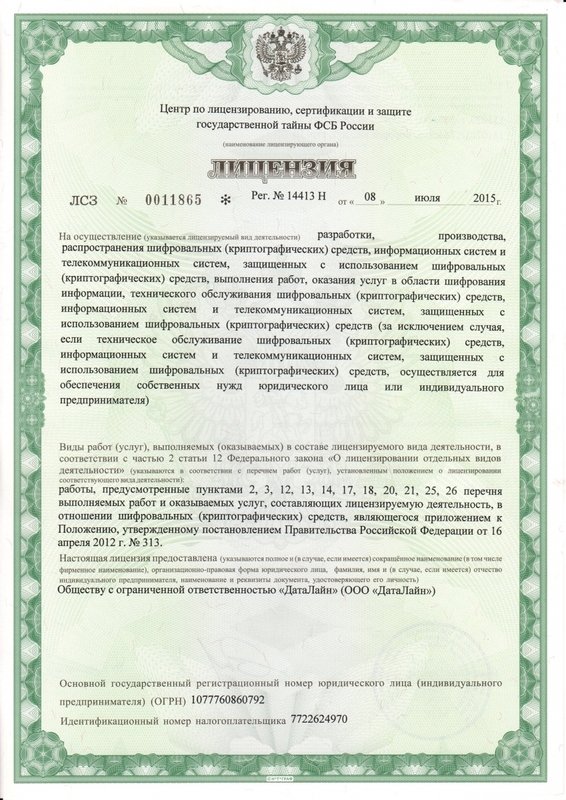 According to the Law, "while collecting personal data, including through information and telecommunications network Internet, the operator is obliged to ensure recording, systematization, accumulation, storage, clarification (updating, changing), and extraction of personal data of Russian citizens with the use of databases located on the territory of the Russian Federation." 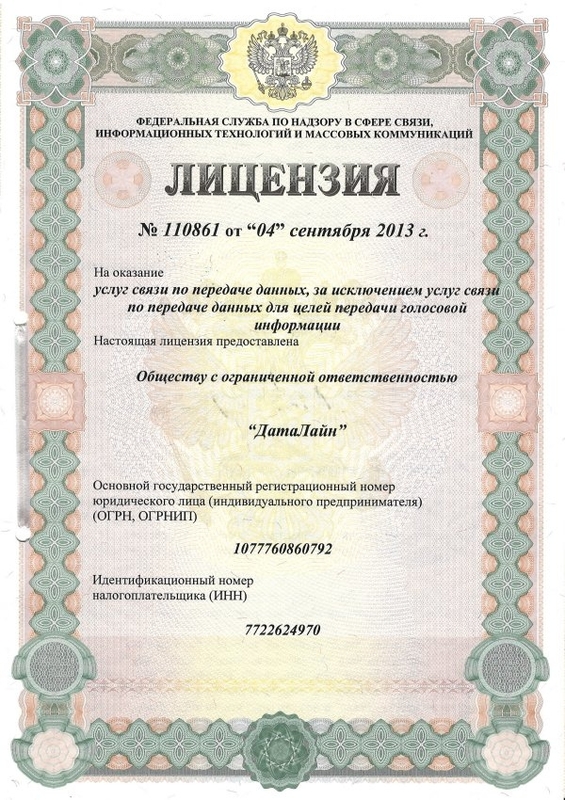 This requirement is especially relevant for organizations using cloud services located outside the Russian Federation. Personal data, except for some of their categories, belongs to restricted information and must be protected under the laws of the Russian Federation. In accordance with the Federal Law dated 27.07.2006 No. 152-FZ "On Personal Data", "while processing personal data, the operator is obliged to take the necessary legal, organizational and technical measures or to ensure their acceptance for the protection of personal data against unauthorized or accidental access, destruction, modification, blocking, copying, supply, distribution of personal data, as well as other illegal action in relation to personal data." (Article 19, Part 1). Confidentiality is not required only for the anonymized or public personal data, as well as personal data subject to publication or to mandatory disclosure in accordance to the law. Moreover, the law "On Personal Data" actually equates depersonalization of personal data to destruction. Thus, in accordance with paragraph 7 of Article 5 of the Law, the processed personal data must be destroyed or anonymized upon achieving the goals of processing or if achieving these goals is no longer necessary. CT Consulting developed DFG152 as a unique toolset for depersonalization and storage of personal data. The solution has broad functionality, scalability, and is fully compliant with the legislation and personal data protection regulators. We provide personal data storage services in the certified data center with the information security requirements in the Russian Federation. Please leave your email address and we will get back to you as soon as possible.